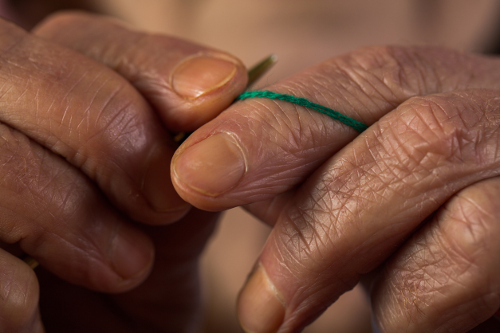 Nail discoloration may be the result of a fungal infection, using dark shades of nail polish, excessive cigarette smoking, or a symptom of an underlying health condition. Yellow nails can be treated and possibly prevented. So, if you want to learn how to get rid of yellow nails with simple home remedies, whether you are a man or woman, young or old, and despite the cause, this article contains effective home remedies for you to try. We depend on the health and appearance of the nails and nailbeds to indicate any hidden health conditions or causes that may not be as apparent at first. These infrequent circumstances may include allergic reactions, rheumatoid arthritis, chronic lung conditions, or lymphatic obstructions. Also, persistent yellow coloring may be a result of diabetes or psoriasis. This article focuses on the more commonly seen cases of yellow fingernails, as well as yellow toenails caused by nail polish and fungal infections. “Vicks” vapor rub contains eucalyptus oil, menthol, and camphor to fight fungal infections while removing discoloration. Eucalyptus oil has been used as a medicinal treatment for fungal ailments by traditional Aboriginal people for hundreds of years. Menthol has antiseptic and antipruritic (anti-itch) properties to treat infections while camphor is a natural antiseptic, disinfectant, and insecticide. Try this remedy on nails daily for up to three months. Clean hands and nails and pat them dry. Apply “Vicks” vapor rub on the nailbeds, cuticles, and surrounding skin in a circular motion. Allow it to set in for two hours, or if left for overnight, wrap nails with gauze. There is no need to rinse the “Vicks” vapor rub off. 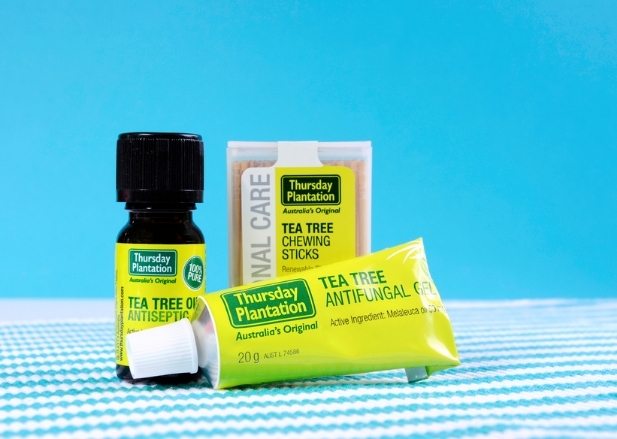 Use the antiseptic, antifungal, and antimicrobial properties of tea tree oil to fight fungus infections causing the yellowing of the nails. It is often combined with extra virgin olive oil to speed up the healing process. Tea tree oil has been used for centuries as a medicinal treatment and is highlighted in more than 300 scientific studies for such use. Repeat this remedy twice a day for up to three months. Combine two or three drops of tea tree oil and one tablespoon of extra virgin olive oil in a small bowl. Mix well and soak a cotton ball or swab into the solution. Dab the applicator onto the nails and nailbeds. Use a new cotton ball or swab to avoid the spread of the infection. Apple cider vinegar (ACV) has strong antifungal properties to treat infections. 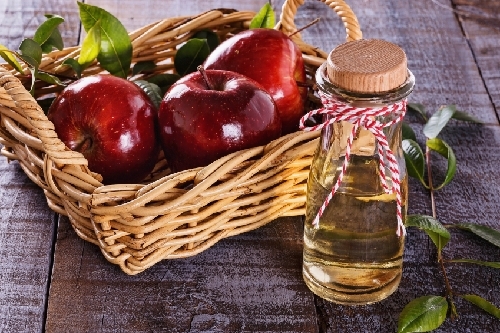 ACV contains acetic and malic acids to fight infections naturally. During treatment with apple cider vinegar, the nails will return to a healthy state and grow naturally. Repeat the remedy twice each day for up to three months. In a small bowl, add half a cup of apple cider vinegar to half a cup of warm water. Mix well and place your fingertips in the bowl. Soak your nails for 20 minutes before drying them with a towel or air-drying. Apply a gentle moisturizer to your hands and nails. “Listerine” mouthwash treats fungal pathogens with its antifungal active ingredients of thymol, eucalyptol, and methyl salicylate. Use the following remedy daily for one week and repeat after taking a week’s break in between weekly treatments. The skin surrounding the nailbed may turn a green or blue hue and will disappear within several days. Pour one cup of any 100% “Listerine” mouthwash in a bowl. Soak nails in the mouthwash for 30 minutes. You can also combine equal parts of “Listerine” and vinegar and soak for a 30-minute treatment daily for seven days. Baking soda is an excellent natural exfoliating agent for stained yellow nails due to nail polish, and hydrogen peroxide can disinfect nails to help prevent infections. Together, these products have powerful bleaching ingredients to remove stains and help keep nailbeds healthy. Use baking soda and hydrogen peroxide together for immediate results. But you should note that the potency of these two together can cause nails to become brittle if used more than once per month. 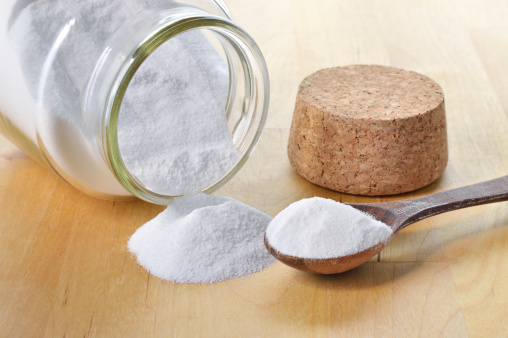 Combine four tablespoons of baking soda and three tablespoons of 3% hydrogen peroxide in a bowl of half a cup of warm water. Mix well to dissolve the ingredients. Soak your nails in the solution for five minutes. Apply a gentle moisturizer to hands and nails once they are dry. 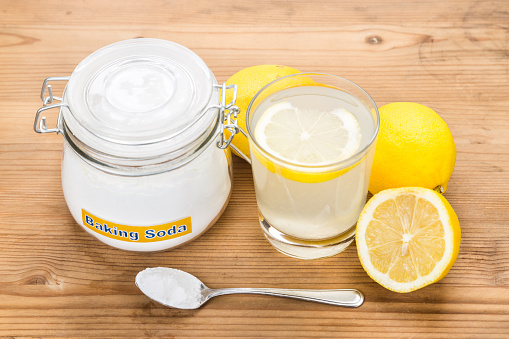 The bleaching and exfoliating powers of baking soda can also be used in combination with the natural decolorizing properties of lemon juice. Lemon juice also has an abundant number of vitamins and minerals to help keep the nails healthy and acts as an astringent. Repeat the following treatment two or three times each month. In a small bowl, combine one teaspoon of fresh lemon juice, one tablespoon of baking soda, and a half teaspoon of extra virgin olive oil. Mix the three ingredients to form a paste. Gently rub the paste onto your nailbeds. Leave it on for five minutes before rinsing it off with warm water. Apply a gentle moisturizer afterwards. Pure white toothpaste has mild abrasives to remove stains from the teeth as well as the nails. 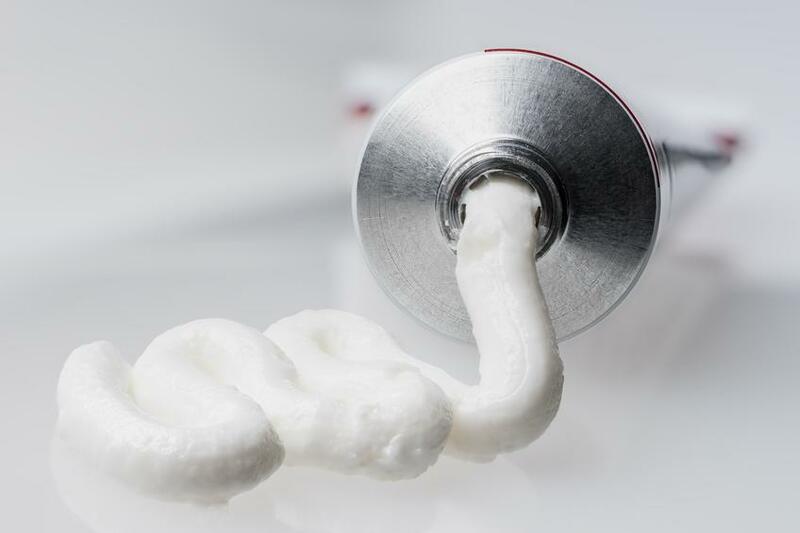 Only white toothpaste should be used as gel-based toothpastes may not offer the same cleaning results. You can also use a white toothpaste that has whitening agents such as hydrogen peroxide. Repeat two or three times weekly for up to one month. Apply white toothpaste to each nail. Gently scrub your nails with a finger or a new soft toothbrush in a circular motion for up to two minutes. Leave the white toothpaste on nails for 10 minutes before rinsing it off with warm water. Then apply a gentle moisturizer to hands and nails once they are dry. 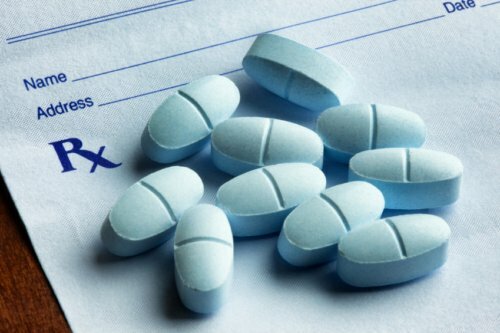 Most denture tablets have citric acid and sodium bicarbonate to fight stains on teeth. These same components may also help to remove discoloration from nails while being gentle on the nailbeds. Follow this remedy for two months with treatments two or three times weekly. Place two denture tablets in a bowl containing one cup of warm water. Soak your nails in the liquid for 15 to 20 minutes. Rinse your hands and nails with cold water. Apply a gentle moisturizer to your hands and nails once they are dry. Keep your nails and nailbeds healthy by drinking plenty of water. Consume fresh vegetables and fruits to get iron, zinc, calcium, and vitamins B and E.
Wash and gently scrub nails throughout the day. Use a gentle moisturizer on hands. Keep nails short with regular manicures. Choose a light-colored nail polish. Use a clear base coat before applying nail polish. Give your nails an occasional break from nail polish. The noticeable change in the color tone of the nails is commonly due to use of a dark nail polish or a fungal infection. Using home remedies and natural products may help restore the nails to their original color while treating any existing fungal infection. These treatments have powerful properties to address the concerns of discoloration. Proper care and treatment of nails on a regular basis may help to prevent recurrences or possibly stop yellow nails from ever developing. “5 Easy Home Remedies To Get Rid Of Yellow Nails,” Natural Home Remedies; http://www.natural-homeremedies.org/5-easy-home-remedies-to-get-rid-of-yellow-nails/, last accessed September 20, 2017. Watson, K., “Yellow Nails,” Healthline, April 3, 2017; http://www.healthline.com/health/yellow-nails#overview1, last accessed September 20, 2017. Ehrlich, S.D., “Eucalyptus,” University of Maryland Medical Center, April 29, 2015; http://www.umm.edu/health/medical/altmed/herb/eucalyptus, last accessed September 20, 2017. “13 Impressive Benefits of Mint,” Organic Facts; https://www.organicfacts.net/health-benefits/herbs-and-spices/health-benefits-of-mint.html, last accessed September 20, 2017. “11 Surprising Benefits of Camphor Essential Oil”, Organic Facts; https://www.organicfacts.net/health-benefits/essential-oils/camphor-essential-oil.html, last accessed September 20, 2017. “How To Get Rid of Yellow Nails,” How To Get Rid, June 19, 2014; http://www.howtogetrid.org/health/how-to-get-rid-of-yellow-nails/, last accessed September 20, 2017. “How To Get Rid of Yellow Nails Instantly,” Fab How; https://www.fabhow.com/get-rid-yellow-nails-instantly.html, last accessed September 20, 2017. “10 Tips On How To Get Rid Of Yellow Nails From Nail Polish Fast,” VKool; http://vkool.com/how-to-get-rid-of-yellow-nails/, last accessed September 20, 2017. “Natural Remedies to Get Rid of Yellow Nails,” DIY Remedies, March 31, 2017; http://diyremedies.org/yellow-nails/, last accessed September 20, 2017.